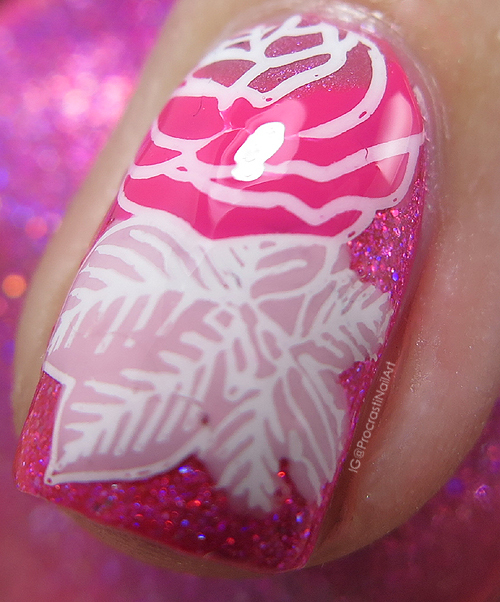 I decided to use one of my favourite stamping plates to create a pink on pink on pink rose design! Check under the cut to see what I used and for more pics! So for my base I started off with one of my new polishes from Indie Expo Canada. 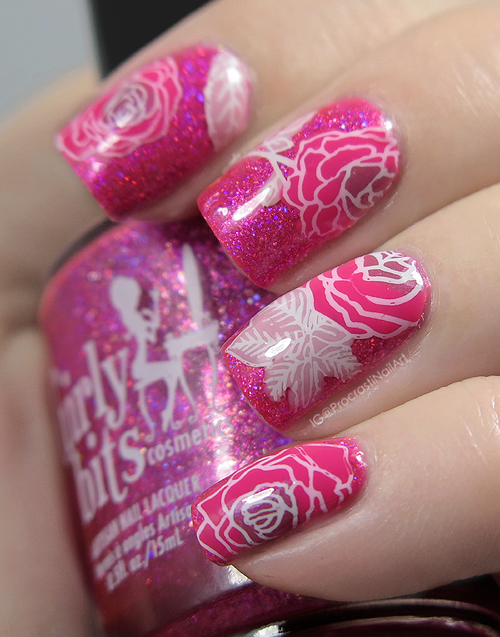 This is Girly Bits Hot Stuff and it's an awesome full coverage pink holo glitter! I made my stamping decals with my BP-99 plate and then filed it in with (darkest to lightest) Fair Maiden Toronto Sunrise, Fair Maiden Tickle Me Pink and OPI Small + Cute = Heart. :) My stamping polish was Mundo de Unas White. Let me know what you think! And HAPPY BIRTHDAY AMY! 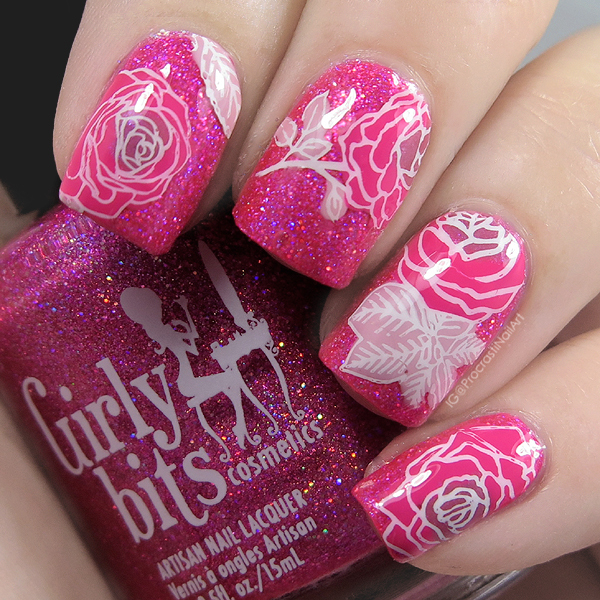 Such pretty floral nails these are! Love it. So beautiful! You inspired me to do decals again today, lol! Oh wow this is gorgeous! You did amazing! I really love the look of the layered pink on pink! Happy birthday, Amy!! This is a great celebratory mani for the occasion! I thought they were decals at first. And not the kind you make yourself. You did a great job! Oh wow, these are beautiful!! I love the polishes you used! On a scale of 1 to awesome, this is AWESOME!! Reverse stamping is just so gorgeous - I love how you used three colors to fill in. 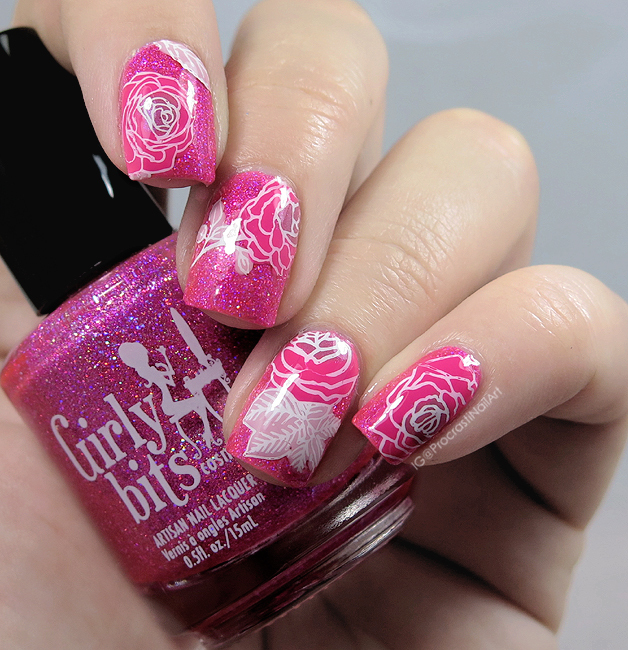 Fabulous stamping! Love the pink on pink!